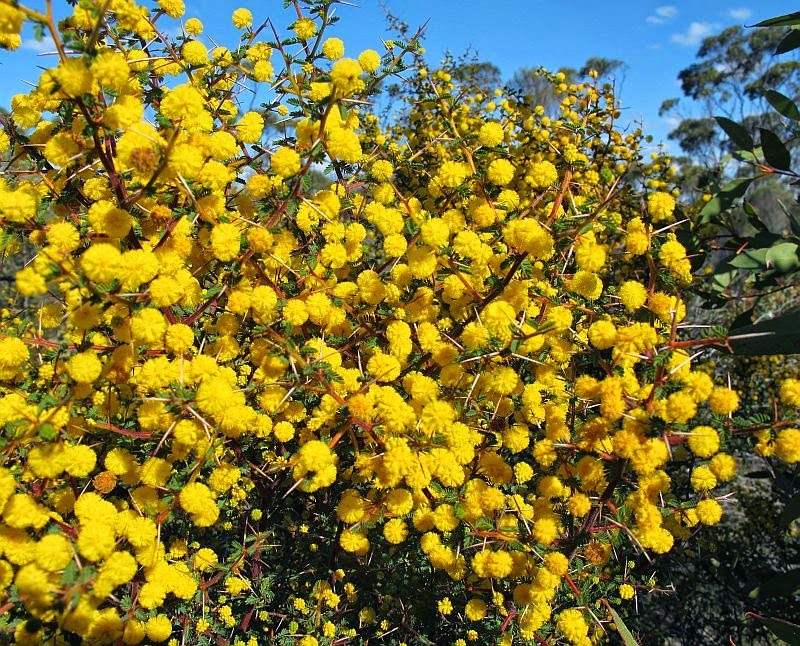 This plant is a most impressive shrub, having masses of rich golden flowers and an awe-inspiring array of sharp thorns, both of which not only add to its attractiveness, but its “don’t mess with me” status. It would make a very effective fast growing hedge to separate antagonists, yet small birds could use it to nest and safeguard themselves from predators. Acacia pulchella var. 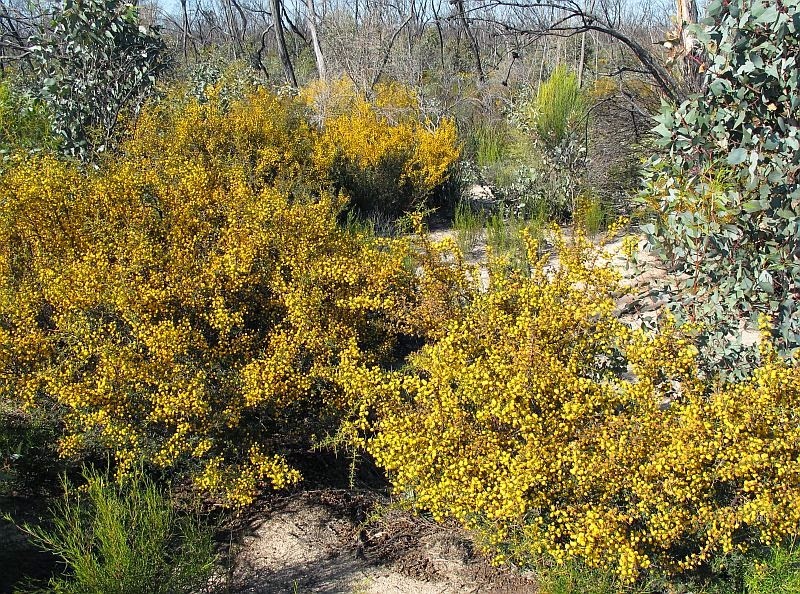 glaberrima grows to over 2 metres (8’) in height and can be particularly common after bushfires, with the above colony scattered around the base of a 1-2 km (1 mile) wide sandy rise. 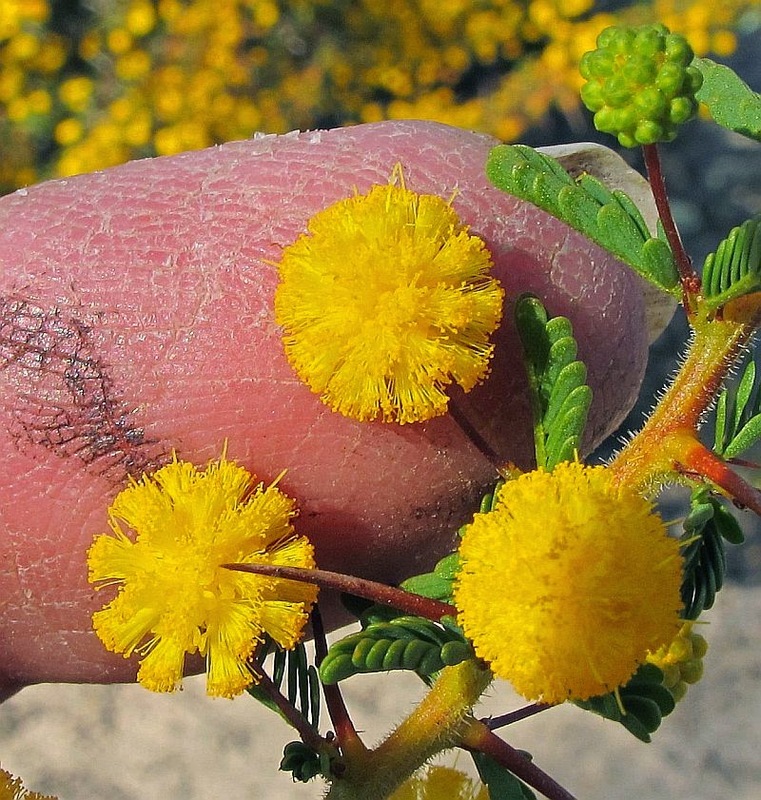 Acacia pulchella is a highly variable plant, with 4 varieties and numerous variants within each variety. 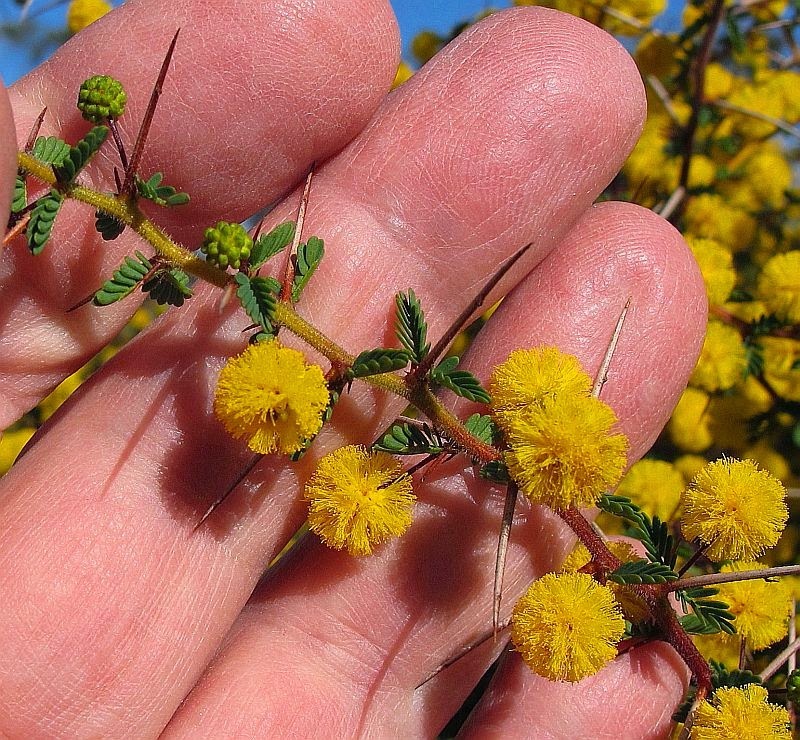 The species above is the fourth variant as detailed in the On Line, World Wide Wattle reference http://www.worldwidewattle.com/speciesgallery/pulchella.php?id=15480, it is separated by having very small pinnae that are only 1- 2 mm (1/16”) long, plus very pronounced spines (thorns). The spines are commonly in pairs, but one is quite small and often goes unnoticed. There are several differences between A. pulchella var. glaberrima and A. pulchella var. pulchella, but there is one feature where they always differ and that is whether the peduncle (main flower stalk) is hairy or not. If it is hairy, (unless the peduncle is less than 5 mm or 3/16” in length, when it too may be without hairs), then it is var. pulchella. 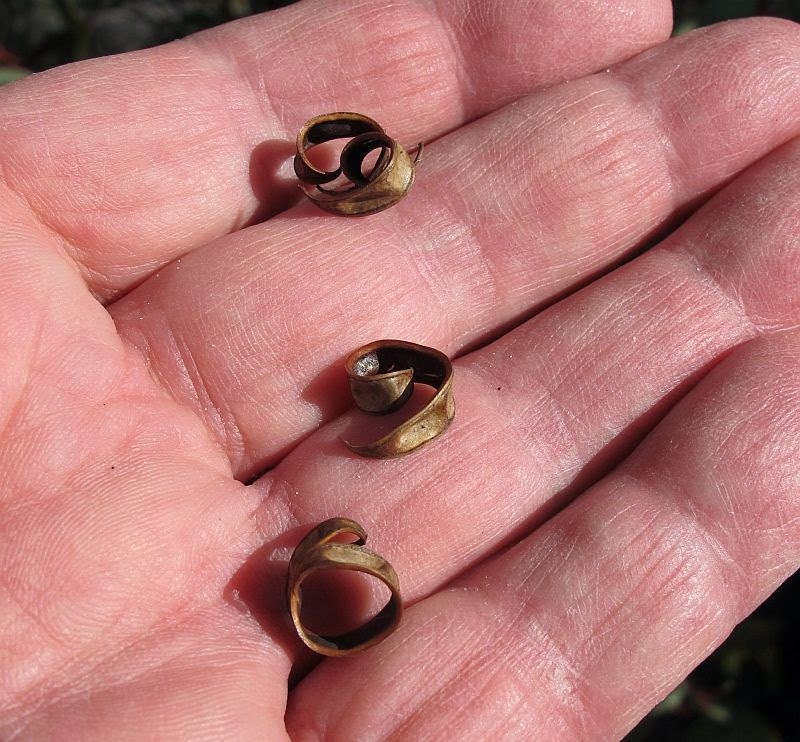 If on the other hand, the peduncle is without hairs (glabrous) and above 5 mm in length, it is var. glaberrima. 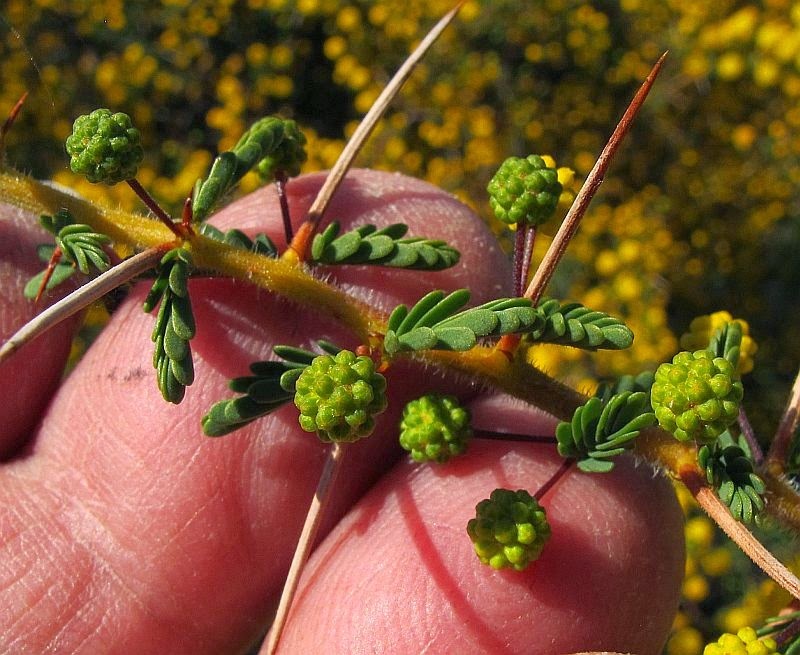 Just to confuse further, there is another similar wattle called Acacia amputata that overlaps with var. glaberrima, but is a smaller plant (less than a metre or 3’ in height), has a much shorter peduncle (1-2 mm or 1/16” in length) and fewer flowers in the floral heads (10-20). Acacia pulchella var. 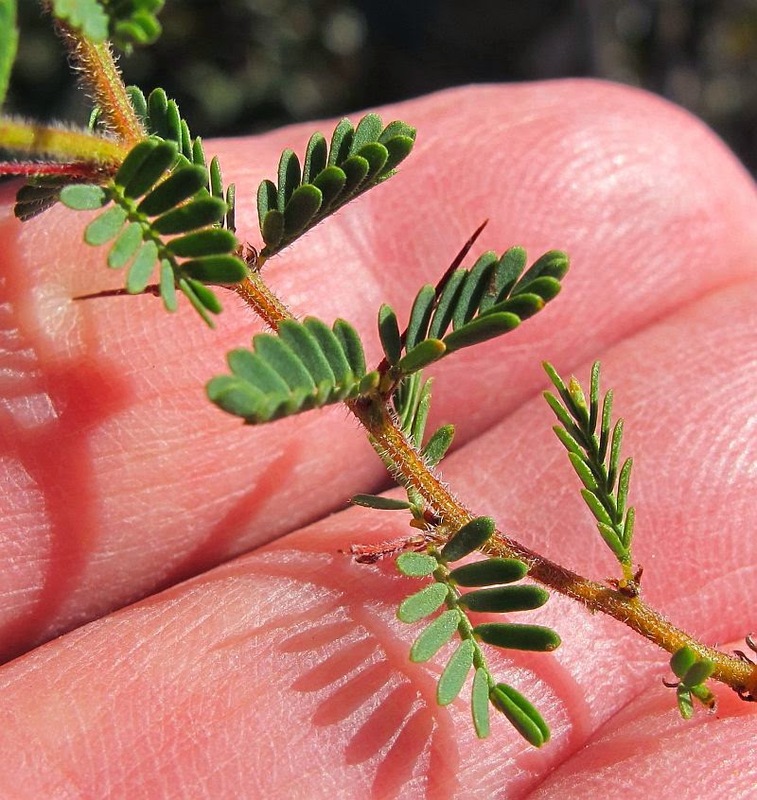 glaberrima and all its variants are distributed from Denmark (west of Albany) to the Geraldton region, plus extending inland to Lake Grace (north of Ravensthorpe), this inland form with much smaller leaves is the Variant 4. The above photographed colony was discovered much further east to 75 km NE of Mt Heywood and over 400 km (250 miles) from Lake Grace. However there is very little development between these locations, with the majority being virgin bush without access of any kind, so it is quite possible this plant exists between in suitable habitat. Flowering is recorded from May to October. Acacia is part of the very large Acacia Fabaceae family that also includes all the Pea Flowers. In other references, it may be listed under under Mimosaceae or Leguminosae.